Esra Demir, 31-year-old teacher who gave birth to a baby at a Batman hospital on Sunday, was reportedly detained by police and taken to a police station with her newborn baby on Monday as part of an investigation into Turkey’s Gülen group. 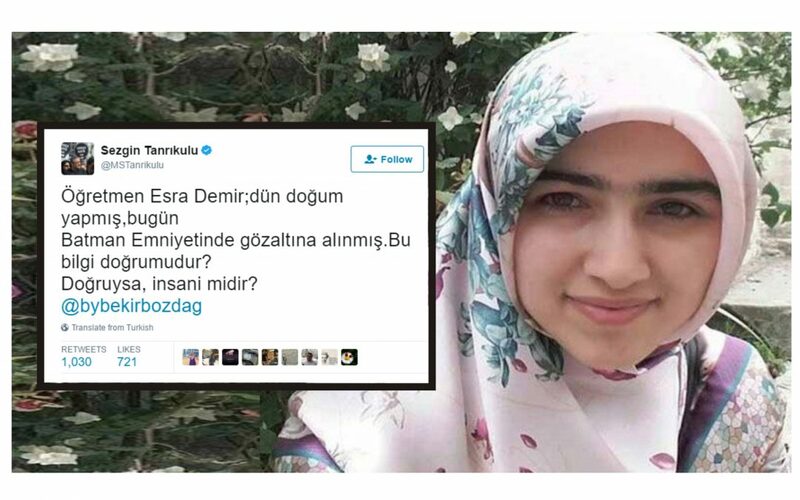 Republican People’s Party (CHP) İstanbul deputy Sezgin Tanrıkulu said in a tweet that Demir was taken by police to Batman Police Station only a day after she gave birth. The Tr724 news portal also reported that Demir gave birth at Batman Dünya Hospital on Sunday and police took her into custody as she was leaving the hospital on Monday. Turkey survived a military coup attempt on July 15 that killed over 240 people and wounded more than a thousand others. Immediately after the putsch, the AKP government along with Erdoğan pinned the blame on the Gülen group, inspired by US-based Turkish Islamic scholar Fethullah Gülen.